My previous story about my Vietnam experience detailed my company’s participation in the Tet ’68 battle on January 31, 1968. After Tet we were on alert for quite some time as the enemy was rooted out of their hiding places throughout the country. 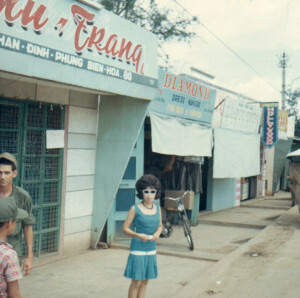 Tet was that we were not allowed into the town of Bein Hoa (pronounced Ben Wa) during our off duty hours. Bein Hoa was within a couple miles of our compound and sat at the doorstep of the Bein Hoa Air Base. It was a couple of months before the town was deemed safe for unarmed G.I.’s to roam the streets to visit the bars, souvenir shops and other attractions that lonesome men desire. 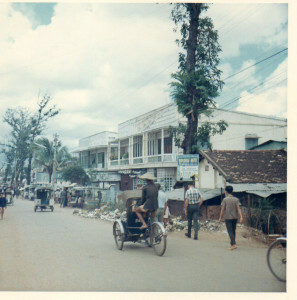 Before Tet I had regularly visited Bein Hoa mostly out of curiosity about the people, to purchase souvenir items or in passing through on my way to the Bein Hoa Air Base BX (Base Exchange). The BX at the air base was better supplied with merchandise than our Army PX (Post Exchange) in our compound. You could buy a lot of merchandise at the Exchanges at a very low price—cameras, electronics, small refrigerators, cigarettes, whiskey, all the necessities of life. I purchased a 12 piece setting of Noritaki china and had it shipped to my mother. Before her death Mom gave it to my wife and it is now proudly displayed in Bonnie’s china cabinet. The seasoned G.I.’s would banter in reply, “I’ve seen your sister and she is number 10.” Before Tet, Bein Hoa had been virtually untouched by the war. After the battle to retake Bein Hoa, it looked like a war zone. Many of the houses and commercial buildings had been punched full of holes in order to root the VC from their enclaves. It was a sad sight. While in Vietnam I worked at nights most of the time at my job printing maps for my brethren in the boonies. Our 12-hour shift ended at 7 a.m. Generally the night shift proceeded directly to their bunks, even bypassing the mess hall, so as to get a few hours of sleep before the sun began to fry everything. It was difficult to sleep in the sweltering heat and the usual noise of the daytime barracks humdrum. By noon I was usually up, showered, got a bite to eat and had several hours to kill before I had to report to my work pad at 7 p.m. Many times I used that free time to visit Bein Hoa and the nearby villages to sight see and take pictures. We were not allowed to take our weapons off base unless we were on official Army work details. It was a bit dangerous to roam the towns, villages, alleyways and countryside without any weapons for protection. However, our sector was fairly secure with our strong military presence in the area. Of course my wanderings were mostly during the day. It was not wise to roam off base at night, although I did a few times without permission. I was too young and too stupid at times to know the danger I may have encountered. When you are young you think you are invincible. In some of the villages I saw rats as large as cats and they seemed fearless. Our company CO got the bright idea that he wanted sod laid in front of the orderly room. Several of us ‘idiot’ volunteers were sent out into the countryside to find some sod. We finally found a grassy area (swamp grass I think) next to a Vietnamese cemetery and began peeling up rolls of sod. It was a bit marshy and every time we lifted our shovels we not only had a slab of sod but also many leeches. The sod never took root in the laterite that covered our compound. My favorite off-base adventure was the dump detail. There was a huge dump near Long Bihn Army Base where the military disposed of their trash and junk. Our detail’s job was to take our printing plates, map waste and anything of a classified nature to the dump. We had to stay there until all the material was burned. The information on these maps, etc. could have been useful to the enemy. While at the dump we noticed the Army had thrown out large quantities of uniforms along with other types of military waste. The uniforms looked unused. Maybe they were from deceased soldiers or just a result of the Army’s wasteful nature. There were also used combat boots. We could not get a new pair of boots, unless we turned in a depleted pair. Therefore several of us enterprising soldiers took a couple of these used pairs to be turned into the supply sergeant for replacement. The new ones were usually sent home via our whole baggage at the end of our tour in Vietnam. The supply sergeant never did catch onto our scam. One advantage of going on an off-base detail was that you got to stop at a local ‘car wash’ to have lunch and get a cold drink. Any soldier who was in ‘Nam knows these ‘car washes’ washed everything except your vehicle. The proprietor usually had only Vietnamese food dishes to eat. They looked a bit strange and I never asked about the ingredients. I thought, “If it does not kill them, it probably will not kill me.” The food was usually quite tasty. We would wash it down with a local Vietnamese beer called ‘33’ which came in green bottles. It was always best to hold a bottle of ‘33’ beer up to the light to make sure there was nothing floating in it before taking a drink. 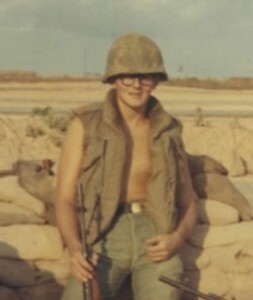 By the time March 6, 1968 rolled around I was getting very ‘short.’ My best childhood friend, Skip, was killed on that date at Khe Sanh in northern South Vietnam which was heartbreaking. I was due to rotate home by the end of April. After 10 months in Vietnam I had become one of the ‘senior’ personnel in our outfit. I had risen to the rank of Specialist 5 (E-5 pay grade) a few months prior. I was only an E-2 pay grade (not even one stripe) when I came in-country in April 1967. I badgered my platoon’s Warrant Officer so much he found a way to promote me quickly. He knew I was putting out excellent work for him and he was receiving most of the credit for it. My Warrant Officer even placed me into another MOS (Military Occupational Specialty) in order to get me promoted. I never worked as a Process Camera Man but my Army separation papers state that I did. All of the original members of our company had rotated home by January 1968. Replacements like me were now the main core of the company and we were training our replacements. We must have been deficient of NCO’s (Non-Commissioned Officers), because I was requested to be Sergeant of the Guard on a couple of occasions. That is not a usual task for a Spec-5. I got to wear a 45 pistol on which I had never been trained, but I had enough experience with firearms that I could have used it effectively if the need arose. With that 45 on my hip I had visions of John Wayne. In retrospect I think I was being prepared for a reenlistment pitch because I was soon offered NCO status as a Buck Sergeant—3 hard stripes. A Buck Sergeant is the same pay grade as a Spec-5, thus there was no more money. I asked if I would have to move to the NCO’s barracks with the ‘lifers’. Of course their answer was “Yes.” I declined their offer just as I had declined the offer to attend OCS (Officer Candidate School) while in basic training. I wanted to get home and back to my good paying civilian job after my 2-year hitch. My friend, Hughes, took the offer and became our Buck Sergeant. Hughes was a good guy but an in-your-face beast. One time when I was sound asleep in my bunk, Hughes decided to wake me. He grabbed my bunk and shook it violently. I reacted instantly by rolling over and kicking him squarely in the chest. He rolled backwards a couple times before coming to a stop. I warned him to never do that again, because I might react in the same manner. I had been having nightmares because of the war. The nightmares always had me with my back to a tree and I was fighting hand to hand with the enemy. My Warrant Officer said he put me in for a Bronze Star for my excellent work while in Vietnam. I never believed him and never found any record of it. I did not deserve any medals. I was presented a Certificate of Achievement from our 20th Engineer Brigade commanding general with the entire company in attendance. The best award I received was to go home unscathed. Soon the day in late July 1968 arrived for me to report to the 199th Replacement Company at Long Bihn for processing. I would be back in the world of round-eyed women and round doorknobs within a couple days. I had received a taste of war, had visited Australia on my R&R, had seen many memorable sights in Vietnam including Saigon and Vung Tau (a resort on the South China Sea), had served with many new friends and had received many unforgettable memories. There was one last thing to do. I tacked my name tag to the wall at the bottom of the row where all the others of our company who had rotated home had theirs on display. The next day I was on a commercial airliner at Tan Son Nhat Air Base in Saigon with a hundred or more other G.I.’s that were returning home also. I was wearing my khaki uniform and had one carry-on bag. All my other ‘stuff’ was shipped in my whole baggage trunk to my home in Dayton. The only other items in my carry-on bag besides a few essentials were three bottles of Crown Royal for my Dad. When that plane lifted off a thunderous roar went up from every G.I. onboard. Returning home was a bittersweet experience. Stay tuned.